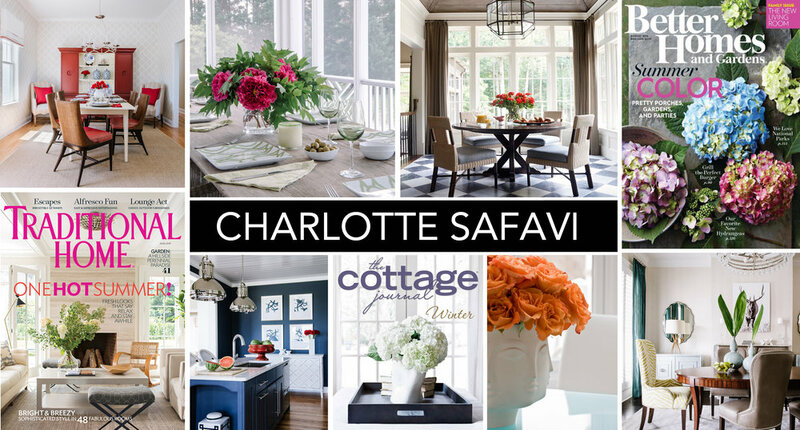 Charlotte Safavi is a magazine writer, stylist, and producer. She also creates magazine-ready portfolios for design professionals and business owners. Her work has appeared in Better Homes & Gardens, Traditional Home, House Beautiful, HGTV Magazine, Southern Living, Milieu, Southern Home, New York Cottages & Gardens, Luxe Interiors + Design, Cottage Journal, This Old House, Storage Solutions, Decor, Cottage Style, Cottages & Bungalows, Romantic Homes, Style at Home, Domino, Dwell, and many more. In the Washington DC-area, she frequently works for Home & Design, DC Modern Luxury, Capitol File, Bethesda Magazine, Arlington Magazine, and Northern Virginia Magazine. She has written for Annapolis Home, Washingtonian, and Baltimore Style. Charlotte has also written travel, food and art articles, as well as personal essays for publications like The Washington Post Magazine, The British Sunday Times Travel Magazine, and The Florida Times-Union. On occasion, she blogs for the Huffington Post and her blogs have been featured online at The Wall Street Journal, National Public Radio and USA Today. Meredith Publications, Hearst Magazines, Hoffman Media, Sandow Media, Engaged Media, Time Inc., TVA Publications, Athlon Media Group, and C&G Media Group are among her clients. She works in Washington, D.C., Virginia, and Maryland, but also travels for work to New York, Massachusetts, Rhodes Island, Texas, California, Florida and more.